As a magician, I promise never to reveal the secret of any illusion to a non-magician, unless that one swears to uphold the Magician’s Oath in turn. I promise never to perform any illusion for any non-magician without first practicing the effect until I can perform it well enough to maintain the illusion of magic. All serious students of magic are welcome to attend up to 3 meetings after which we expect you to join the club. There is no cost to attend 3 regular meetings prior to joining. Special meetings (e.g. lectures, shows or banquets) may incur charges at the non-member rate. Meetings are held at our normal location in San Jose unless otherwise noted: Yu-Ai Kai Community Center at 588 North 4th Street, San Jose, CA 95112. See map on this page. How Do I Join? What does it Cost? Have a sincere interest in the performance, history and/or collection of magic and magic effects. Be voted in by the existing club members. Don't worry - this is not as scarey as it sounds! Do not be shy about saying that you want to join! In addition to the initial and annual costs to be an IBM Member, you must also pay annual dues to the club. The annual dues for Ring 216 are currently $25/year and are payable in January - see pay dues for details. Unless you have previously met all the above requirements, you cannot join the club on the night of a special event. NOTE: Dues are very low because we barter entertainment for meeting space. As such, you may be asked to perform or assist with a show for one of our sponsoring organizations. What Happens with the Dues? We use the dues collected to hire professional lecturers, pay for supplies related to the club (stamps, paper, etc. ), rent rooms for special events, and so on. Normally those who are members of the club enjoy discounted (sometimes FREE) entrance to lectures. Who Are the Professional Lecturers? How Often? We have had the following in the last several years: Bill Goldman, Amos Levkovitch, Dale Salwak, Mike Stroud, Bob Sheets, Docc Hilford, Michael Close, Johnny Ace Palmer, Bruce Bernstein, Steve Silverman, Ron London, Whit Haydn, Dan Harlan, Eugene Burger, Daryl, Danny Archer, Charles Gauci, Jay Scott Berry, Josh London, Martin Nash, Aldo Colombini, Paul Cummings, Joshua Jay - and others! Normally we sponsor from 2 to 5 outside lecturers per year. Is this a Secret Society? No! But we do keep secrets! We take an oath to not reveal secrets needlessly. What Is A Typical Meeting Like? Meetings begin at 7:30 PM, and generally end by 10:00 PM. There are generally from 35 to 65 people present - more at special events. Ages are from 12 years old through advanced age. Most members are men. The first half-hour is usually dedicated to a teaching session on some aspect of magic (e.g. a card trick, technique, or tip on creating a show). The next 15 minutes or less of the meeting are to conduct business - that is let the people know about club status, upcoming events, and allow the members to share information about resources and events of general interest to the club. Next we have a break and provide a sign-up sheet for those who volunteer to perform. 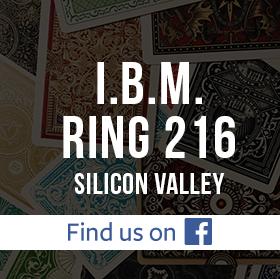 Performing is not required, although if you desire to join IBM and the Ring 216 we do expect you to demonstrate some skill and knowledge of magic. Generally there is a theme for the meeting but it is NOT necessary to perform an effect that is in keeping with the theme. On some nights we feature competitions for which an award is given. After the performances we sometimes have a formal teaching session. The topic is usually related to the theme of the meeting. Next we have an informal sharing time until 10:00 PM. You may learn how to do a fancy card flourish, teach others a new effect, solicit feedback on the routine you have performed or are working on, or just catch up with the friendly folks there. After the formal meeting quite a few folks are in the habit of convening at a local restaurant for dinner/dessert and continued sharing.